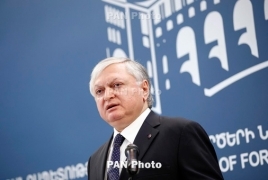 PanARMENIAN.Net - Armenia expects to sign the new Comprehensive and Enhanced Partnership Agreement with the European Union during the next Eastern Partnership (EaP) Summit, foreign minister Edward Nalbandian told an EaP ministerial meeting on Monday, June 19. The 5th EaP Summit will take place in Brussels on November 24. According to Nalbandian, some issues still remain to be tacked , including the launch of dialogue on visa liberalization. “In this regard, we expect the support of the EU member states,” he said.